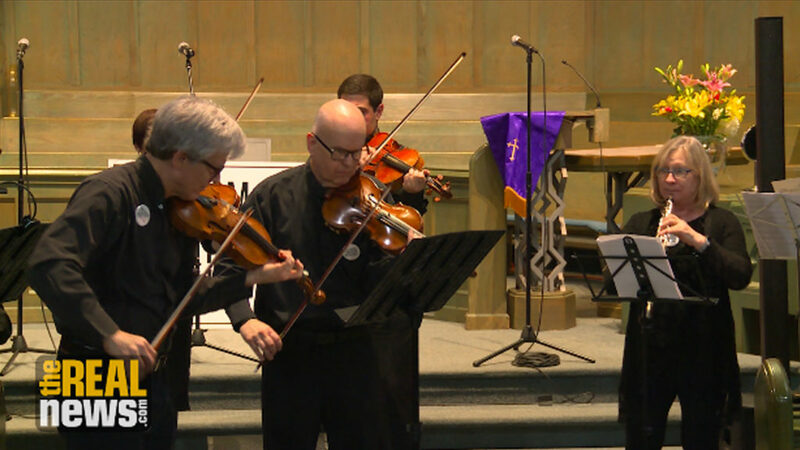 Over 100 people attended a solidarity concert at Union Baptist Church on Monday, March 25, and helped raise nine thousand dollars for Vivian Obijekwu. VIVIAN OBIJEKWU: And I just want to start off by saying thank you so much from the bottom of my heart. I’m very, very appreciative. I’m full of gratitude. I did not expect any of this. Especially to NNU for supporting me since February 4 when I was terminated. JAISAL NOOR: A former nurse at Baltimore’s Johns Hopkins Hospital who says she was terminated for taking part in efforts to unionize the hospital with National Nurses United, members of the Baltimore Symphony Orchestra, as well as musicians Ryan Harvey and Brooks Long. For its part, Hopkins says it doesn’t comment on personnel matters, but they did say they respect the rights of all their employees to form a union and that they “follow a standardized and rigorous human resources process before any employee is dismissed.” Hopkins nurses who said they stood in solidarity with Vivian spoke out. TONY FOWLER: I’m here tonight because one of my co-workers, Vivian, was unfairly fired. She is a leader on her unit, she was willing to speak out, with about ten other nurses, that there were some discrimination and some safety issues going on the unit. And consequently, she has been targeted and retaliated against, and she has been fired. And unfortunately, it was one week after she put in her paperwork for family medical leave, as she’s months pregnant. So now, she is without an income and without health insurance. TONY FOWLER: As far as nurses not supporting the union, Hopkins has put on a very aggressive anti-union campaign. And one of the things that they’re telling the nurses at Hopkins is that, “Oh, we’re going to get to all that. We were just about to do that, we’ve been looking into this for years.” But I can tell you from having worked for Hopkins for as long as I have worked for Hopkins, they are always just about to do something, and they rarely actually do anything until they’re pushed up against the wall. JAISAL NOOR: Members of the Baltimore Symphony Orchestra also voiced their support for Obijekwu. Its members have been locked in contract negotiations for months. GREG MULLIGAN: Nurses and BSO musicians have different occupations. We share the same general concerns. Both occupations take a lot of training, dedication, and teamwork. Musicians and nurses want to be treated with respect. In our workplace, we now have 20 vacancies in our 98 person orchestra. How can we stay world class with a vacancy rate like that? Johns Hopkins hospital workers are also working short staffed. There are fewer full-time employees and the vacancies sometimes are filled with part-time replacements. When a hospital doesn’t have enough nurses, patient care suffers. 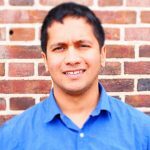 JAISAL NOOR: On June 4th the National Labor Relations Board will hear allegations the hospital has waged an anti-union campaign against nurses who have sought to unionize. Reverend Al Hathaway, Senior Pastor at Union Baptist, says he opened his doors to the event when he heard of Obijekwu’s plight. AL HATHAWAY: The reason why I’m here, the reason why we’re hosting this event, is that we find so many instances in society and in our city where persons who seek to do the right thing find themselves being abused, taken advantage of, or even overcome by forces that are stronger than them. So I was drawn to the situation of Nurse Vivian, who’s a good spirit, a nice person, you can tell she has a service spirit. We actually found ourselves in a situation where Johns Hopkins Hospital, I believe, was not fair to her. JAISAL NOOR: He said Hopkins, which has faced staunch opposition over a number of issues, like seeking an armed private police force, has much work to do in the community. RYAN HARVEY: I think Hopkins still has a way to go. They have to make certain that they respect the rights of every individual. I know many of the leaders there at Hopkins, I know in their heart they do want to do the right thing, but the right thing is demonstrated every day in every situation on behalf of every person. So I want them to make certain that they realize that every person is important, every person is significant, and they should relate to every person as they wish the community would relate to them. JAISAL NOOR: A spokesperson said all the funds raised will be donated to Obijekwu. For full disclosure, National Nurses United has previously donated to The Real News Network, most recently in 2016. With Cameron Granadino, this is Jaisal Noor in Baltimore. CORRECTION: The story originally incorrectly stated Obijekwu’s case will be heard at the June 4th NLRB hearing. We regret this error.